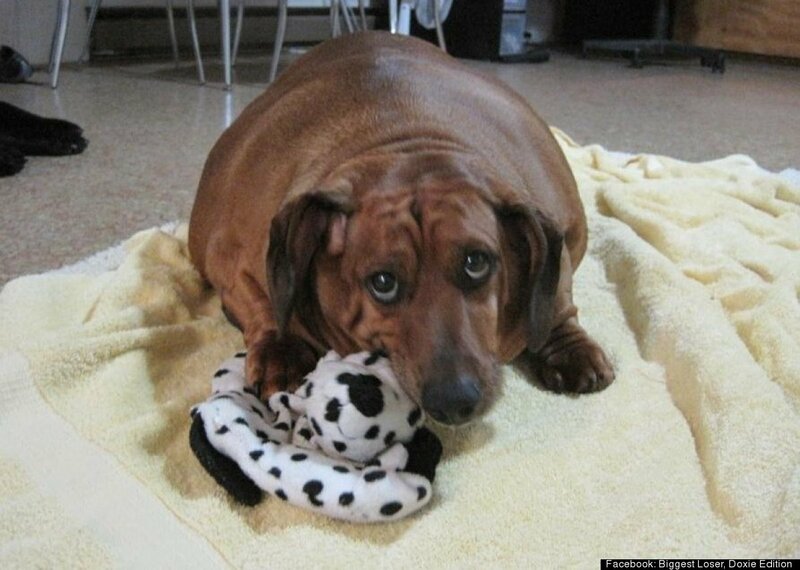 One adorable Dachshund is on a mission to lose a whopping 40 lbs, relinquishing his title as world's fattest wiener dog. Obie, who currently weighs a staggering 77 lbs, was rescued by Portland resident, Nora Vanatta, after he was almost fed to death by his previous owners, reports Oregon Live. Currenlty twice the size of an average doxie, Obie has been placed on a strict diet to shed the excess pounds. A dog lover with two healthy and active dogs of her own, Vanatta first heard about Obie's plight through the Oregon Dachshund Rescue on Facebook. A relative of the dog's elderly owners pleaded for someone to help the 5-year-old over-fed doxie. Vanatta, who has a degree in animal science and is a certified veterinary technician, stepped up to the challenge and now faces the difficult task of getting Obie into shape. Vanatta is working with a dog food brand to feed Obie a low-fat, high-protein diet, reported Oregon Live. Despite the extra pounds, Obie is still in fairly good health; however, he cannot engage in regular exercise. According to the Sun, Obie has been introduced to a special hydrotherapy regime. When he loses a little weight, a treadmill will be added to his workout routine. "My hope is that he can be an inspiration to any person or animal trying to lose weight. It is so important to introduce pups and kids to a healthy lifestyle and food choices as early as possible," Vanatta stated on the Biggest Loser, Doxie Edition Facebook page.